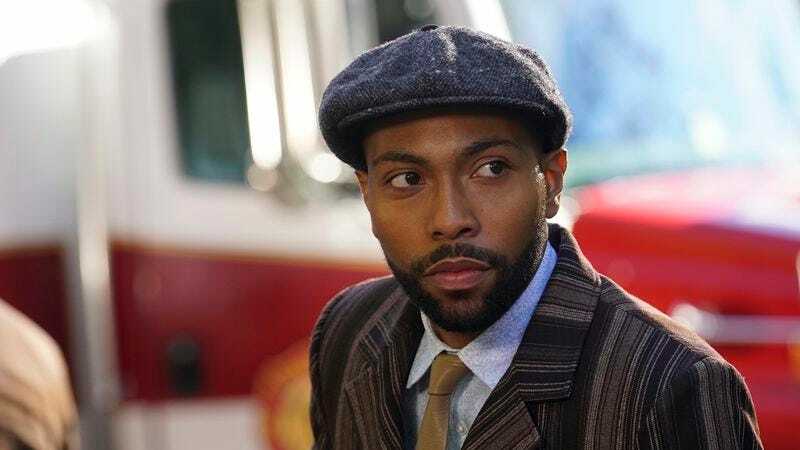 Tonight’s episode of Legion provides a proper introduction to Jeremie Harris’ Ptonomy, who we briefly met at the end of the pilot. He’s one of the mutants residing at the Summerland compound run by Melanie Bird (Jean Smart), and his powers as a “memory artist” allow him to both recall everything that has ever happened to him, and dig into other people’s pasts. In that sense, he has already been crucial in providing insight into David Haller (Dan Stevens), even though our hero is an extraordinary case. Speaking with The A.V. Club, Harris—like co-star Aubrey Plaza—teased a “crazy ride” ahead. For now, he talked with us about how he learned about his character’s powers and guessing who he could possibly be playing. The A.V. Club: Ptonomy is called a “memory artist.” Are we just scratching the surface of what he can do? Jeremie Harris: We’ll get in depth into his abilities and his powers and the way he fits within the series and how he works very closely with David. AVC: Once you got the role, how were his powers described to you? JH: When we were shooting the pilot Noah [Hawley, the showrunner] had us all over to his house. He spoke to me about it. He said, “You could think of being able to remember everything as something that’s really cool and fun.” But he wanted me to think about how it can be a burden as well and about how difficult it could be and how challenging and complex it is to remember every single thing that happened in your life. What can happen sometimes when you think of having abilities or mutant powers, you can think, “Oh this is really cool.” But he wanted me to really think about how complex it could be. Not just like, “I won’t ever forget where my keys are” or “I won’t ever lose anything,” but how it feels to remember traumatic things that may have happened in your life and never forget them. How does it feel to remember every single key that you have ever seen in your entire life versus just never being able to forget where you put your keys? AVC: We see Ptonomy having an almost patient-therapist relationship with David. Was that part of the way you conceived the character? JH: Our relationship definitely gets more complex as the series goes on. I think initially the way I wanted to think of it was that this is someone who maybe I’m even wary of or on the fence about. For myself, I created that Melanie Bird—Jean Smart’s character—has done so much for me and I’m so loyal to her, so I know how important David is to her and her idea of what he can do for us and the battles that we’re up against. I was thinking of it as—I need to be here for this guy because Melanie is telling me that he can help us, and I’m loyal to her. I know she’s helped me overcome so many things in my life, done so much for me that I deserve to give him as much help as I possibly can. Additionally, I know that Ptonomy has done this work with so many other mutants who are at Summerland. It’s not something that is foreign to me until we get deeper into his mind and I realize that this particular mutant is something I haven’t experienced before. AVC: There’s a moment where you mention that Melanie thinks David is key to “winning the war.” Do you see Ptonomy as soldier? JH: Yeah, I definitely think he’s a leader and a soldier and obviously a thinker. I think he takes his role very seriously—the role that he plays within winning this war. Yeah, I think he knows that this isn’t a joking matter like—we’ll die, we’ll get killed. I think he recognizes that. You know, I like to think of him as—not an older man—but I had a director describe him to me like, “Have you ever been around an old man and they have this chill energy and sometimes an intensity because they’ve seen so much and experienced so much?” I think because of the fact that he’s been in so many other people’s minds and seen other people’s trauma, in addition to his own trauma, as well as the stakes of the present situation. I think he realizes how serious this is. AVC: Can you tell us anything about the nature of this war that’s coming and what we should expect? JH: It’ll get crazy. It’s a war between people who are afraid of the fact that we are different, that we aren’t like the majority of people. I think that sometimes when people are different and you haven’t taken the time to get to know them or understand them it can be very easy to just want to do harm to them or want to oppress them or wipe them out. Obviously this is a fiction story, but that has been proven true in real life as well. It’s a war between people who are othered—who are us, mutants—versus the people who fear us because they can’t understand us and fear that they may not be able to control us so they want to eradicate us. As the series goes on you find out more of who those people are. AVC: Is there any significance to Ptonomy’s name? JH: I haven’t gotten anything specifically about his name. I’m sure at some point in time, hopefully if we continue on with the show it will come out. He does have another name that comes out later in the show as well. I don’t know if I can say or share what that is. We were on set one day and Melanie called me this other name. I was like, “Wait, whoa.” I think I went to the script supervisor, and was like, “Hey, is this an accident?” And then I think they reached out to Noah and he was like, “No that’s his other name.” I was like, “Oh, okay. Cool.” So I do have another name as well, but I haven’t gotten the specifics about what Ptonomy means from Noah. AVC: Is that other name one we might recognize as fans of X-Men? JH: I don’t think so. When I spoke to Noah about it he said that Ptonomy is from his mind. Because when I first got the audition… I found an X-Man that I thought was maybe this character based on the description that I got from the sides. But then once I landed it and I spoke to Noah he let me know that, no, this is from his own mind. The other name, I don’t think it’s going to be anyone that you’d recognize as another character. AVC: Do you mind sharing which X-Men character you thought it was? JH: I thought it was Prodigy. I think the description I had was, “He’s brilliant.” I think it might have said something like “a child prodigy.” Then I found out more about Ptonomy and I was like, “Oh, okay, that’s not the same person.” With Marvel they limit your information so much in the beginning because it’s all top secret and very tight-lipped. AVC: How is Ptonomy going to approach these blocks in David’s mind? JH: I think the main thing is getting David to let go of those blocks. David is so powerful that if he doesn’t let go of those things then no one can work through them. So it’s really about getting him to get on board. That’s not really what I do, but that’s what I think Melanie is working on and Syd [Rachel Keller]. It’s so trippy and it’s so unexpected. I have friends who are sending me theories about what’s going on. I’m like, “Oh, okay, yeah, sure. Just wait and see.” It’s going to be much different than I think anyone can expect. AVC: The series is dealing with questions of both mental illness and how the outside world sees those who are different. Do Ptonomy’s own struggles align with these themes? JH: We definitely get into a little bit more of Ptonomy’s back story and his own issues that he’s trying to overcome as well as the series goes on. We see that although he seems like a very confident and straightforward person he also has memories that still trouble him as well. I guess you could argue about his own mental health issues, because he has so many memories in his mind that he can’t let go of. That is a burden to him as well. We get a piece of that as the show goes on. I know he has a better grasp on it, obviously, than David, because he’s been dealing with it for much longer. He has a stronger sense of self than David does, because David’s been told he’s this particular thing for his entire life up until the moment that he meets us. Ptonomy definitely has a stronger grasp on the issues that he’s dealing with, but he definitely has issues of the mind as well.